Abu Dhabi: Khamees Salona is the first patient to undergo a robot-assisted total knee replacement at a public hospital — Shaikh Khalifa Medical City — in the UAE. A day after he underwent the procedure on March 8, he managed to take the first few steps on his new right knee. “It is a special feeling, knowing that I was able to undergo the surgery close to home in the UAE, surrounded by family and friends and at the hands of renowned Emirati surgeon. I hope to walk without pain soon,” the 61-year-old Emirati defence consultant told Gulf News. The innovative procedure, in which surgeons use an Artificial Intelligence-supported system to remove damaged bone tissue and place an implant, is still new in the region, with the first procedure being carried out at a private hospital in Dubai only last year (2018). Salona, who worked as a police officer for 35 years, had been suffering from debilitating pain in his right knee for more than a decade. He had also had a fall three years ago that had worsened the pain, and an arthroscopy he underwent abroad had failed to provide any relief. Following the knee replacement, Salona is now recovering at the hospital, and is expected to be discharged within three days. He will have to undergo regular physiotherapy for at least a month or two to gain full function of his knee joint, but should be able to walk on his own afterwards, Dr Al Hammadi said. “Damage to the knee, whether as a result of an injury or because of ageing-related wear and tear, can be very debilitating. The pain is so severe that patients are even unable to sleep at night, and end up hooked to painkillers. 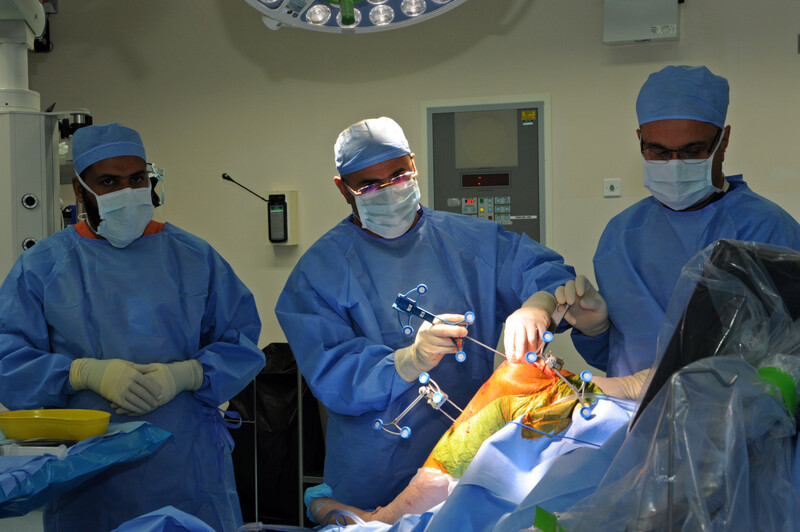 Knee replacement surgeries are therefore becoming more and more common,” Dr Al Hammadi said. “The availability of robot-assisted systems will allow us to serve more patients, while also ensuring that the surgeries are more precise and effective,” he added. In fact, international studies have shown that a one per cent revision of the procedure is needed two years after a robot-assisted knee replacement, which is four times lower than the rate following a conventional technique. “The UAE is powering ahead to offer more AI-driven advancements, and the availability of such surgeries shows that the health care sector will benefit greatly,” Dr Al Hammadi added.